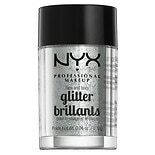 Shop NYX Professional Makeup Face & Body Glitter Ice (.08 oz. ).08 oz. Shop Extracts Bath Glitter Fizzer Set (8.4 oz. )8.4 oz. Add a little extra shimmer to your look by using body glitters. You can use these body shimmer products on your legs, face and other areas to give your skin a fun glow. Here at Walgreens.com, we carry body glitters in spray, mist and liquid form among other options from brands such as Aero Minerale and Jerome Russell. Body glitter for your legs can make a great accessory for just about any skirt, dress or pair of shorts. You can even use it in place of pantyhose. The shimmer in these products is generally subtle for a healthy glow. You can use other body glitters on your hair, skin or both. Control the amount of glitter you use to create a subtle effect or an eye-catching sparkle. Besides body glitters, you can find other shimmer products to add a little extra something to your look. There are shimmer lotions that deeply moisturize to make your skin soft and supple. Shimmer powders can add a bit of fragrance while helping you stay fresh and dry throughout the day.